Advertise with Us - Western Massachusetts Chiefs of Police Association, Inc.
Promote your business on the Western Massachusetts Chiefs of Police Association, Inc. website with a sponsored ad banner. Our targeted audience includes all Chiefs of Police and Police Departments throughout Western Massachusetts as well as our Members, Committees, and Students attending the Basic Reserve / Intermittent Training Program at Springfield Technical Community College in Western Massachusetts. 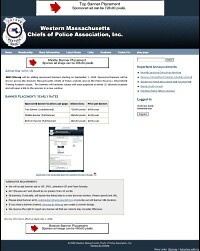 WMCOPA.org offers sponsored banners randomly rotating with each page load on three (3) site wide locations on the Western Massachusetts Chiefs of Police Association website as well as on the Reserve / Intermittent Training Police Academy pages. Sponsors may choose top, middle, or bottom placement of banner as shown in the example below. Banners will link to sponsor's website if applicable. A bonus Business Sponsor link will also be listed on our links page. Click here for example banner placement download. We will accept banner ads in GIF, JPEG, animated GIF and Flash formats. ALT (Mouseover) text should be no greater than 10 words. All banners, if clickable, will launch the linked site in a new browser window. Please specify link URL. Please email banner ad to webmaster(at)wmcopa(dot)org or provide current banner URL location. If you need a banner created, our webmaster can create a custom design. We reserve the right to reject any banner ad that our visitors may consider offensive. By clicking the "Submit Form" button below, I hereby attest that the above information is accurate and I agree to pay for banner advertising at the above rates. I have full authority to represent the business entity named above, allow copying and use of any materials provided in the above website URL and any electronically submitted materials provided to wmcopa.org, and assume responsibility for any claims made against wmcopa.org arising from the publication of this advertisement.